The deeply unromantic life of a low-rent geisha. Some work the high-end world of Kyoto and Tokyo, and others work out of cheesy hot-spring resorts, their fare a stream of small-time businessmen, factory owners, and petty gangsters. Such was Masuda's lot back in the 1940s, when this rudimentarily trained geisha served more as an indentured servant and prostitute than an artful consort. Nonetheless, it was a step up from her stint as a nursemaid, beginning at age six, when she subsisted on leftovers and was mortified, tormented, and slapped about by adults and kids alike. 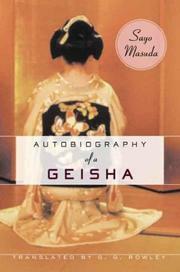 In need of money, her mother called Masuda home and promptly sold her to a geisha house when she was 12. This unvarnished account, first published 45 years ago and still in print in Japan, does not paint a pretty picture. “Geisha's pride wasn't worth a broken straw sandal,” writes Masuda, who made the mistake of falling in love and was then tossed out by the patron, who had bought her from the house. Turned away by her family, she reunited with her younger brother (“My dreams, my affections, they were all for him. He was my reason for living”), and together they struggled to survive in postwar Japan. In stark prose as fateful as a Greek tragedy, she captures a wholly dreadful existence hustling a few illegally foraged potatoes to a starving population for a few yen. When her brother contracted tuberculosis, Masuda intended to return to prostitution to pay for his penicillin, but he threw himself from the hospital roof rather than let that happen. She stayed hungry and harassed, thanks to hypocritical anti-prostitution laws passed in the ’50s (and taken to pieces here), until this account shocked Japanese readers with its bitter taste of grinding poverty and its revelations about the geisha world’s dark side. A comfortless portrait of the flip side of the geisha world, where one is more slave than courtesan. A rock and a hard place—and enough to give readers gray hair.